These cute waterproofs are available in black, beige, red and grey colors. 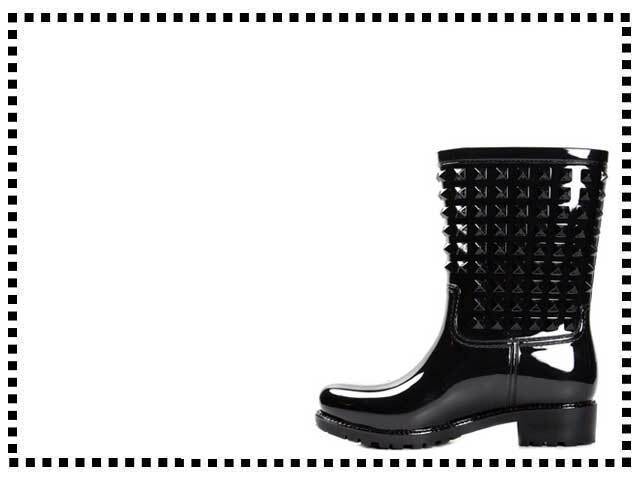 The high gloss finish and short rubber spikes make these boots a stylish option for the rainy days. Very pretty boots, I was so pleased when I opened them. They do run a bit big but I wear thick socks anyway with rain boots so they are fine. Nice boots. They are quite inexpensive but they look great. Super cute rubber boots. They had a very strong rubber smell when I first opened them but they are fine now. Too big for me. Order a size down if you buy these. Nice boots though. A bit on the big side for me. They are cute so I have kept them, I just wear thick socks. Short length spike embellished rain boots.